Part of the solution relies on a previous Johns Hopkins efforts with Project Emerge. 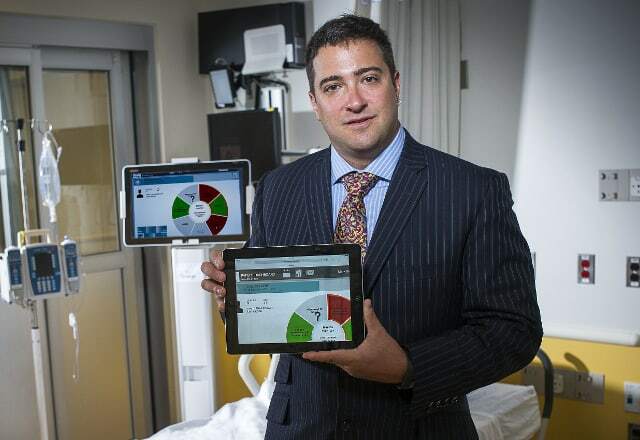 Project Emerge uses a $9.4 million (US) grant to create tablet-based apps to help coordinate data for clinicians. The foundation of Project Emerge is a tablet application that coordinates and integrates all data from all monitoring equipment and information systems. Rather than scavenge medical records, devices and other sources to ensure patients receive all the appropriate care, clinicians can use the tablet app to quickly see all data in one location. The tablet apps were also designed to help patients and their families interact with the health staff at hospitals. Patients and family members could use the bedside tablet and app to ask questions about health care, and include a patient’s favorite music or television programs. Couple with Project Emerge, Microsoft’s Cloud will help scale the university’s earlier solution to bring real-time date-driven intelligence to patient care soon. Using Microsoft’s Azure computers, Johns Hopkins University will be able to tap into massive amounts of storage, analytics, and actionable insights while having everything tied together across mobile efforts, sensors and upcoming Internet of Things (IoT) devices. Our mutual goal is to deliver Project Emerge to health organizations across the country and transform the way care is delivered by arming health professionals with the right information, at the right time. Over the past few months, we’ve been reporting about how Microsoft’s cloud-connected efforts are making splashes in the health industry as it allows caregivers to jump in and out of mountains of metrics while also streamlining processes for many hospitals. Project Emerge is currently just a pilot program and it may take some time before its partnership with Microsoft bears any tangible fruit, but the possibilities for improving health care seem to be within arms reach. What do you think of Microsoft's continued push into healthcare?